This order traces its origin to the prophet Elias and his community of religious on Mount Carmel in Palestine. It has been especially favored by the Mother of God with her brown scapular given to St. Simon Stock in 1251 and her promise that this order will last till the end of time. The Carmelites were reformed in the sixteenth century by the holy Spanish mystics St. Teresa of Avila and St. John of the Cross. They returned the community to its pristine state as Our Lord had directed them. The reformed Carmelites are also known as Discalced (shoeless) Carmelites and have produced many canonized saints, among whom is the great modern nun, St. Therese of the Child Jesus, also known as the Little Flower. The primitive Rule, which St. Teresa and St. John re-introduced by their divinely inspired reform, provides the way for chosen souls to fulfill the command to love God and neighbor. Each religious leaves behind family, friends and possessions to gain Jesus by the vows of poverty, chastity and obedience. As the beloved of Our Lord, she becomes an enclosed garden in which she and God may lovingly commune and wherein He may dwell and find comfort and consolation. This self-abandonment and total dedication of her being adds efficacy to her prayers as she intercedes and obtains supernatural aid for the Church, for souls, and especially for priests. With the Little Flower the Patroness of the missions as her model, every Carmelite heart burns with apostolic charity for her fellow men. Carmelites seek to achieve these lofty goals by leaving the world and entering within the protective walls of the monastery. 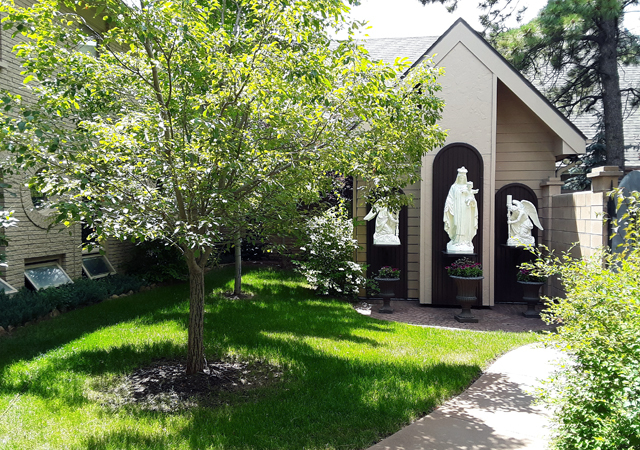 The cloister minimizes distractions and provides the silence needed for the great work of prayer and contemplation. Many hours each day are spent in Holy Mass, singing of the entire Divine Office, mental prayer, the rosary, spiritual reading and other religious exercises. Within these walls of holiness, the nuns also perform many works of love for the care and beauty of the altar as well as for the benefit of the faithful by making scapulars and other sacramentals. The monastery walls not only guard against the world so peace, prayer and holiness can blossom, but they also stand as the towers of a fortress where spiritual war is waged against sin and evil. Carmelites taste of struggle as much as they taste of the sweetness of contemplation and spiritual joy. They live an austere life of penance and renunciation to make reparation for the sins of us all and to implore God’s pardon. They ask Heaven’s blessing upon our lives, and they continually beg for the salvation of our souls. With this, it is evident how greatly needed in these times are their life and beautiful vocation.